At Howe Tools we stock brush cutters from suppliers including; Makita, Hitachi and Bosch. Brush cutters are used to tackle garden ground work that a lawn mower cannot access. They are more powerful than a garden trimmer and can deal with heavy-duty tasks that garden strimmers would struggle to cope with. 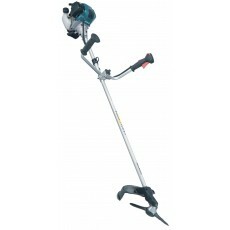 Brush cutters can be used to cut brambles, long grass, twigs, small branches and weeds. The brush cutters we have available are either electrically powered or petrol powered. Our electric brush cutters are powered by rechargeable li-ion batteries and are ideal for home users. Alternatively, our petrol brush cutters are great for long periods of use, and are well suited to professional users. Brush cutters are available with different shaped handles, designed for certain types of work. ‘Loop handled’ brush cutters are better if the ground is uneven, or sloped, as they offer a steadier grip. On the other hand, ‘Cow horn’ handled brush cutters are better for cutting large areas of weeds or long grass where the ground is relatively flat. Safety is important when using a brush cutter, as the powerful blades of the brush cutter can occasionally throw debris up into the air. So it is advisable to wear protective clothing and a hard hat with a safety visor to protect your eyes and face during use.